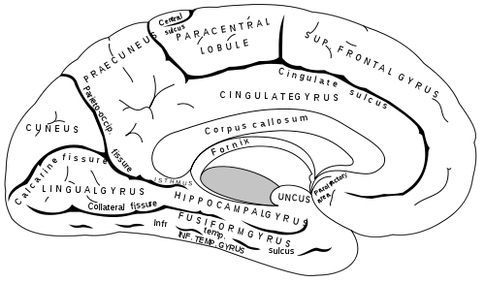 The corpus callosum is the gateway via which information may travel from one brain half to the other. However, it also acts to limit information exchange since almost 40% of the adult callosum lacks myelin). Since mylein acts to insulate and, thus, preserve information transmission by minimizing leakage and increasingly conduction velocity and integrity (Konner, 1991; Rogart & Ritchi, 1977; Ritchie, 1984), some information is lost and degraded even when transfer is possible. Moreover, particularly when one is dealing with complex or emotional information situations probably sometimes arise in which one brain half has little or no knowledge as to what is occurring in the other (Dimond, 1980; Dimond & Beaumont, 1974; Dimond et al. 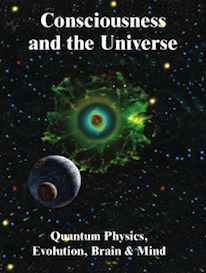 1972; Geschwind, 1965; Joseph, 1982, 1988a, 1992b; Joseph et al. 1984; Marzi, 1986; Myers, 1959). In part, this is a consequence of lateralized specialization. Certain forms of information can only be processed and, thus, recognized by the right or left half of the brain. Even information that is transferred may be subject to interpretation and miss-interpretation (Joseph, 1982, 1986ab, 1988ab; Joseph et al., 1984) and this includes even the learning of sequential and fine motor movements (Hicks 1974; Taylor & Heilman 1980; see also Parlow & Kinsbourne 1989). 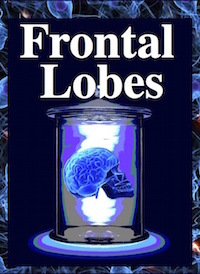 In addition, one brain half can be prevented from knowing what is occurring in the opposite half due to inhibitory or suppressive actions initiated by, for example, the frontal lobes, such that certain forms of information are suppressed, censored, and inter-hemispheric (as well as intra-hemispheric) information transmission prevented (Hoppe, 1977; Joseph, 1982, 1988a, 1992b). Thus, there sometimes results a functional commissurotomy (Hoppe, 1977; see also Galin, 1974). Therefore, these three conditions --lateralized specialization, frontal lobe inhibitory activity, and incomplete myelination of callosum axons-- can reduce the ability of the two hemispheres to communicate among normal, intact individuals. Hence, in many ways the brain of even a normal adult is functionally split and disconnected, and for good reason. 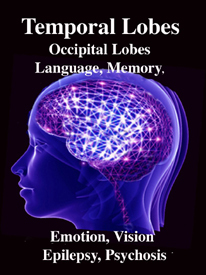 These conditions protect the brain and linguistic consciousness from becoming overwhelmed. 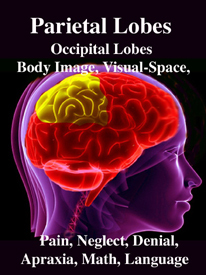 As we have seen with frontal lobe damage, when communication is allowed to occur freely (due to disinhibition) the overall integrity of the brain to function normally is curtailed dramatically. 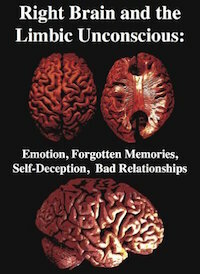 Nevertheless, a unique side effect of having two brains that are not always able to communicate completely and successsfully is intra-psychic conflicts. That is, we sometimes find ourselves feeling happy, sad, depressed, angry, etc. without a clue as to the cause. In other instances, we actually may commit certain thoughtless, impulsive, overly emotional, or embarassing actions and "have no idea" as to "what came over" us. To posit the notion that we have such experiences simpl "because" is absurd. 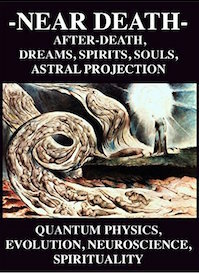 Nor, among "normals," are such experiences always due to biochemical fluctuations or the result of "unconscious" urges. Rather, unbeknownst to the left brain, sometimes the right perceives, remembers, or responds to some external or internal source of experience and/or to its own memories and, thus, reacts in an emotional manner. The left (speaking ) hemisphere in turn only knows that it is feeling something but is unsure what or why , or, conversely, confabulates various denials, rationalizations and explanations which it accepts as fact. Akelaitis (1945, p. 597) describes two patients with complete corpus callosotomies who experienced extreme difficulties making the two halves of their bodies cooperate. "In tasks requiring bimanual activity the left hand would frequently perform oppositely to what she desired to do with the right hand. For example, she would be putting on clothes with her right and pulling them off with her left, opening a door or drawer with her right hand and simultaneously pushing it shut with the left. These uncontrollable acts made her increasingly irritated and depressed." Another patient experienced difficulty while shopping, the right hand would place something in the cart and the left hand would put it right back again. Both patients frequently experienced other difficulties as well . "I want to walk forward but something makes me go backward. ' A recently divorced male patient noted that on several occasions while walking about town he found himself forced to go some distance in another direction. 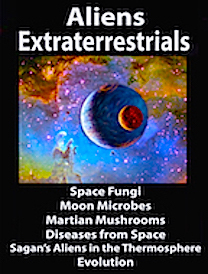 Later (although his left hemisphere was not conscious of it at the time) it was discovered (by Dr. Akelaitis) that this diverted course, if continued, would have led him to his former wife's new home. Geschwind (1981) reports a callosal patient who complained that his left hand on several occasions suddenly struck his wife--much to the embarrassment of his left (speaking) hemisphere. In another case, a patient's left hand attempted to choke the patient himself and had to be wrestled away (Goldstein; cited by Geschwind, 1981). 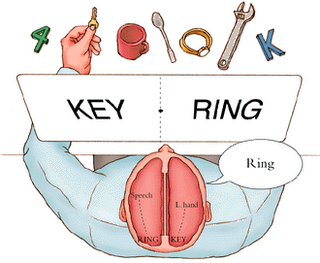 Brion and Jedynak (1981) indicate that this type of independent left sided (right hemisphere) activity was common in their split-brain patients and termined it the "alien hand." In addition, Bogen (1979, p. 333) indicates that almost all of his "complete commissurotomy patients manifested some degree of intermanual conflict in the early postoperative period." One patient, Rocky, experienced situations in which his hands were uncooperative; the right would button up a shirt and the left would follow right behind and undo the buttons. For years, he complained of difficulty getting his left leg to go in the direction he (or rather his left hemisphere) desired. Another patient often referred to the left half of her body as "my little sister" when she was complaining of its peculiar and independent actions. A split-brain patient described by Dimond (1980, p. 434) reported that once when she had overslept her "left hand slapped me awake." This same patient, in fact, complained of several instances where her left hand had acted violently. Similarly, Sweet (1945) describes a female patient whose left hand sometimes behaved oppositionally and in a fashion which on occasion was quite embarrassing. Similar difficulties plagued a split-brain patient on whom I reported on (Joseph 1988b). Indeed, after callosotomy, this patient (2-C) frequently was confronted with situations in which his left extremities not only acted independently, but engaged in purposeful and complex behaviors --some of which he (or rather, his left hemisphere) found objectionable and annoying. For example, 2-C complained of instances in which his left hand would perform socially inappropriate actions (e.g. attempting to strike a relative) and would act in a manner completely opposite to what he expressively intended, such as turn off the TV or change channels, even though he (or rather his left hemisphere) was enjoying the program. Once, after he had retrieved something from the refrigerator with his right hand, his left took the food, put it back on the shelf and retrieved a completely different item "Even though that's not what I wanted to eat!" On at least one occasion, his left leg refused to continue "going for a walk" and would only allow him to return home. In the laboratory, he often became quite angry with his left hand, he struck it and expressed hate for it. Several times, his left and right hands were observed to engage in actual physical struggles. For example, on one task both hands were stimulated simultaneously (while out of view) with either the same or two different textured materials (e.g., sandpaper to the right, velvet to the left), and the patient was required to point (with the left and right hands simultaneously) to an array of fabrics that were hanging in view on the left and right of the testing apparatus. However, at no time was he informed that two different fabrics were being applied. After stimulation the patient would pull his hands out from inside the apparatus and point with the left to the fabric felt by the left and with the right to the fabric felt by the right. Surprisingly, although his left hand (right hemisphere) responded correctly, his left hemisphere vocalized: "Thats wrong!" Repeatedly he reached over with his right hand and tried to force his left extremity to point to the fabric experienced by the right (although the left hand responded correctly! His left hemisphere didn't know this, however.). His left hand refused to be moved and physically resisted being forced to point at anything different. In one instance a physical struggle ensued, the right grappling with the left. Moreover, while 2-C was performing this (and other tasks), his left hemisphere made statements such as: "I hate this hand" or "This is so frustrating" and would strike his left hand with his right or punch his left arm. In these instances there could be little doubt that his right hemisphere was behaving with purposeful intent and understanding, whereas his left brain had absolutely no comprehension of why his left hand (right hemisphere) was behaving in this manner. Thus, due in part to the slow pace of corpus callosum myelination, coupled with differential right and left cerebral specialization, the left hemisphere of a young child has at best incomplete knowledge of the contents and activity that are occurring within the right. This sets the stage for differential memory storage and a later inability to transfer this information between the cerebral hemispheres once the child reaches adulthood. Because of lateralization and limited exchange, the effects of early "socializing" experience can have potentially profund effects. 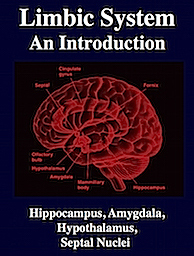 "As a good deal of this early experience is likely to have unpleasant if not traumatic moments, it is fascinating to consider the later ramifications of early emotional learning occurring in the right hemisphere unbeknownst to the left; learning and associated emotional responding that later may be completely inaccessibile to the language centers of the left half of the brain. 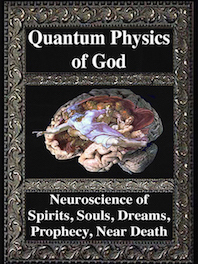 That is, although limited transfer in children confers advantages, it also provides for the eventual development of a number of very significant psychic conflicts --many of which do not become apparent until much later in life." 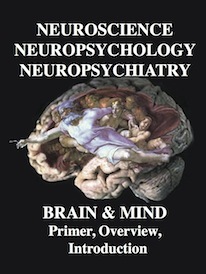 Moreover, due to the immaturity of the callosum, children frequently can encounter situations in which the right and left cerebrum not only differentially perceive what is going on, but are unable to link these experiences so as to understand fully what is occurring or to correct misperceptions (Galin, 1974; Joseph, 1982, 1992b). Consider, for example, a young divorced mother with ambivalent feelings toward her young son (Galin, 1974; Joseph, 1988a, 1992b). Although she does not express these feelings verbally, she conveys them through her tone of voice, facial expression, and in the manner in which she touches her son. She knows that she should love him, and at some level she does. She wants to be a good mother and makes herself go through the motions. However, she also resents her son because she has lost her freedom, he is a financial burden, and he may hinder her in finding a desirable mate. She is confronted by two opposing attitudes, one of which is unacceptable to the image she has of a good mother. Like many of us, she must prevent these feelings from reaching linguistic consciousness. However, this does not prevent them from being expressed nonlingusitically via. the right brain. Her son, of course, also has a right hemisphere which perceives her tension and amibivalance. The right half of his brain notes the stiffness when his mother holds or touches him and is aware of the manner in which she sometimes looks at him . Worse, when she says, "I love you," his right hemisphere senses the tension and tone of her voice and correctly perceives that what she means is, "I don't want you" or, "I hate you. " His left hemisphere hears, however, "I love you" and notes only that she is attentive. 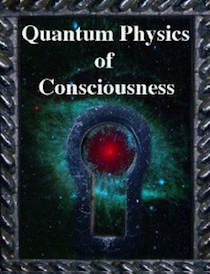 He is in a "double bind" conflict, with no way for his two cerebral hemispheres to match impressions. The right half of this little boy's brain feels something painful when the words "I love you" are spoken. When his mother touches him, he becomes stiff and withdrawn because his right hemisphere, via the analysis of facial expression, emotional tone, tactile sensation, etc. is fully aware that she does not want him. Later, as an adult, this same young man has one failed relationship after another. He feels that he can't trust women, often feels rejected, and when a girl or woman says "I love you," it makes him want to cringe, run away, or strike out. As an adult, his left hemisphere hears "Love," and his right cerebrum feels pain and rejection. Because the two halves of his cerebrum were not in communication during early childhood, his ability to gain insight into the source of his problems is greatly restricted. The left half of his brain cannot access these memories. It has "no idea" as to the cause of his conflicts. 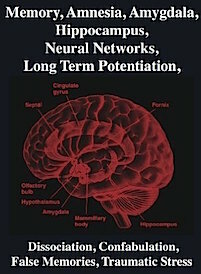 In this regard, this asymmetrical arrangement of hemispheric function and maturation may well predispose the developing child in later life to come upon situations in which it finds itself responding emotionally, nervously, anxiously, or neurotically, without linguistic knowledge, or without even the possiblity of linguistic comprehension as to the cause, purpose, eliciting stimulus, or origin of its behavior. As a child or an adult, it may find itself faced with behavior that is mysterious, embarrassing, etc. "I don't know what came over me." For most individuals it is extremely difficult if not impossible to verbally recall events which occurred before the age of three and a half (Dudycha & Dudycha, 1933; Gordon, 1928; Joseph, 2000; Waldvogel, 1948; White & Pillemer,1979). . There are several reasons for this (see chapter 29). Information processed and experienced during infancy vs. adulthood is stored via certain transformations and retrieval strategies which are quite different. As the brain matures and new information processing strategies are learned and developed, the manner in which information is processed and stored is altered. Although these early memories are stored within the brain, the organism no longer has the means of retrieving them, i.e., the key no longer fits the lock. That is, early experiences may be unrecallable because infants use a different system of codes to store memories whereas adults use symbols and associations (such as language) not yet fully available to the child (Dollard & Miller, 1950; Joseph, 1982, 2000; Piaget, 1952, 1962, 1974). Much of what was experienced and committed to memory during early childhood took place prior to the development of lingusitic labeling ability and was based on a pre- or nonlinguistic code (Dollard & Miller, 1950; Freud, 1900). Hence, the adult, who is relying on more sophisticated and language-related coding systems, cannot find the right set of neural programs to open the door to childhood memories. The key does not fit the lock because the key and the lock have changed. The inability to recall early memories is also a function of programmed cell death--the loss of memory-laden neurons which are shed by the millions over the course of early development and the immaturity of the corpus callosum in children (Joseph, 1999b, 2000). That is, non-verbal information perceived and processed by the right vs left hemisphere is generally stored in the right vs left hemisphere. Later, when the commissures mature, this information cannot be transferred except under special conditions. As is now well known, the developing organism is extremely vulnerable to early experience during infancy such that the nervous system, perceptual functioning and behavior may be altered dramatically (Bowlby 1982; Casagrande & Joseph 1978; 1980; Diamond, 1985, 1991; Denenberg 1981; Ecknerode et al. 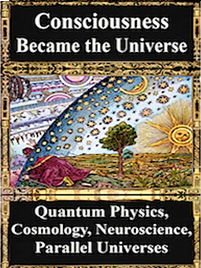 1993; Harlow & Harlow 1965; Joseph 1979; Joseph & Casagrande 1980; Joseph & Gallagher 1980; Joseph et al. 1978; Langmeier & Matejcek 1975; Rosenzweig 1971; Salzinger et al.1993; Sternberg et al. 1993). Interestingly, there is some evidence that the right cerebral hemisphere and the right amygdala may be more greatly affected (see Denenberg 1981; Diamond, 1985). Moreover during these same early years our traumas, fears, and other emotional experiences, like those of an adult, are mediated not only by the limbic system, but also via the nonlinguistic, social-emotional right hemisphere. And, just as they are in adulthood, these experiences are stored in the memory banks of the right cerebrum. However, much of what was experienced and learned by the right half of the brain during these early years was not always shared or available for left hemisphere scrutiny (and vice-versa). That is, a childs two hemispheres are not only functionally lateralized, but limited in their ability to share and transfer information. In many ways, infants and young children have split-brains (Deruelle & de Schonen, 1991; Finlayson 1975; Gallagher & Joseph 1982; Galin et al. 1979ab; Joseph & Gallagher, 1985; Joseph et al. 1984; Kraft et al. 1980; Molfese et al. 1975; O'Leary 1980; Ramaeker & Njiokiktjien, 1991; Salamy 1978; Yakovlev & Lecours 1967). Indeed, due to the immaturity of the corpus callosum and in particular, the slow rate of axonal myelin within the callosum (Yakovlev & Lecours, 1967), communication is so poor that children as old as age 4 have mild difficulty transfering tactile, auditory, or visual information between the hemispheres, e.g., accurately describing complex pictures shown to the right brain (Joseph et al. 1984). That is, in addition to differential functional specialization, the slow development of the myelination process can in turn slow and disrupt axonal information transmission (e.g. Konner, 1991; Ritchie, 1984; Salamy 1978). Indeed, although pain can be transmitted and received via axons devoid of myelin, this type of data is completely lacking in complexity and is devoid of initial cognitive attributes. Pain transmitting axons have very simple requirements. By contrast as data complexity increases, so too does the complexity of those neurons which transmit these signals (Konner, 1991; Ritchie, 1984). For example, as axon diameter increases, so too does the extent of myelination. Similarly, quantities of axoplasm and cytoplasm, nuclear diameter, and neuronal packing density are also correlated with myelination (Konner, 1991). Conversely, lack of myelin, or those neurons which have not yet myelinated, are associated with an increased susceptibility to conduction failure and interference due extraneous influences, including signal modification by neighboring axons (Konner, 1991; Ritchie, 1984). In the intact, normal brain, even non-emotional memory traces appear to be stored unilaterally rather than laid down in both hemispheres (Bures & Buresova 1960; Doty & Overman 1977; Hasegawa et al., 1998; Kucharski et al. 1990; Levy, 1974; Risse & Gazzaniga, 1979). Moreover when one hemisphere learns, has certain experiences, and/or stores information in memory, this information is not always available to the opposing hemisphere; one hemisphere cannot always gain access to memories stored in the other half of the brain (Bures & Buresova 1960; Doty & Overman 1977; Hasegawa et al., 1998; Joseph, 1986b, 1988ab, 1992b; Kucharski et al. 1990; Levy, 1974; Risse & Gazzaniga 1979). 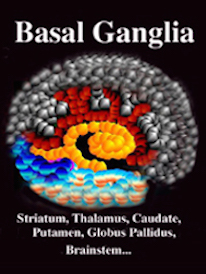 To gain access to these lateralized memories, one hemisphere has to activate the memory banks of the other brain half via the corpus callosum (Doty & Overman, 1977; Hasegawa et al., 1998) or anterior commissure (Kucharski et al. 1990). This has been demonstrated experimentally in primates. For example, after one hemisphere had been trained to perform a certain task, although either hemisphere could respond correctly once it was learned, when the commissures were subsequently cut, only the hemisphere that originally was trained was able to perform--i.e., could recall it. The untrained hemisphere acted as though it never had been exposed to the task; its ability to retrieve the original memories was now abolished (Doty & Overman, 1977; see also Hasegawa et al., 1998). In a conceptually similar study, Risse and Gazzaniga (1979) injected sodium amytal into the left carotid arteries of intact patients so as to anesthetize the left cerebral hemisphere. After the left cerebrum was inactivated, the awake right hemisphere, although unable to speak, was still able to follow and behaviorally respond to commands, e.g., palpating an object with the left hand. Once the left hemisphere had recovered from the drug, as determined by the return of speech and motor functioning, none of the eight patients studied was able to verbally recall what objects had been palpated with the left hand, "even after considerable probing." Although encouraged to guess most patients refused to try and insisted that they did not remember anything. However, when offered multiple choices in full field, most patients immediately raised the left hand and pointed to the correct object! 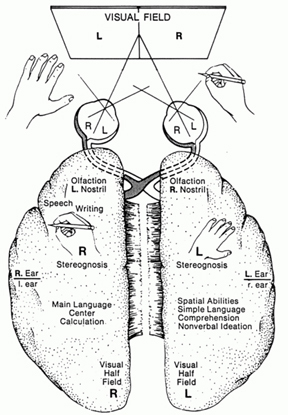 According to Risse and Gazzaniga (1979), although the memory of touching and palpating the object was not accessible to the verbal (left hemisphere) memory system, it was encoded in a nonverbal form within the right hemisphere and was unavailable to the left hemisphere when normal function returned. 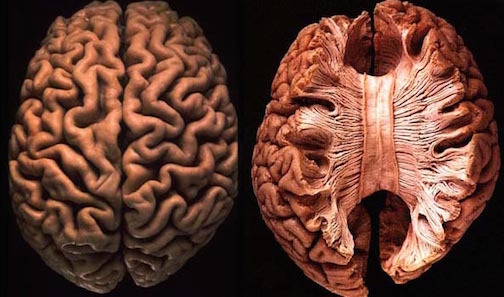 The left (speaking) hemisphere was unable to gain access to information and memories stored within the right half of the brain. 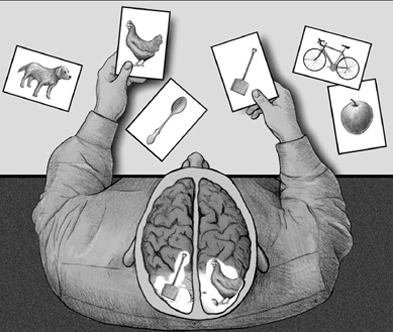 Nevertheless, the right brain not only remembered, but was able to act on its memories. 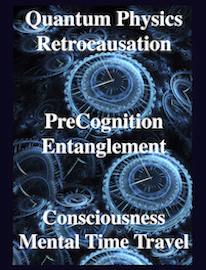 This indicates that when exchange and transfer is not possible, is in some manner inhibited, or if for any reason the two halves of the brain become functionally disconnected and are unable to share information, the possibility of information transfer at a later time is precluded (Bures & Buresova, 1960; Hasegawa et al., 1998; Kucharski et al. 1990; Risse & Gazzaniga, 1979) -even when the ability to transfer is acquired or restored. The information is lost to the opposite half of the cerebrum. 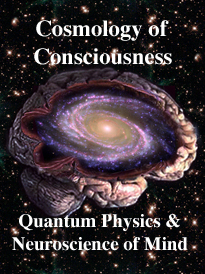 Moreover, because some types of information are processed by the right and left hemisphere in a wholly different fashion, they are unable to completely share or gain access to the data or even the conclusions reached by the other -as they are unable to process or recognize it -which in turn precludes complete interhemispheric transfer (Berlucchi & Rizzolatti, 1968; Hicks, 1974; Joseph, 1982, 1988a; Marzi, 1986; Merriam & Gardner, 1987; Miller, 1990, 1991; Myers, 1959, 1962; Rizzolatti et al. 1971; Taylor & Heilman 1980); information is lost during the transfer process. Nevertheless, although inaccessible or lost, these memories, details, and attached feelings can continue to influence whole brain functioning in subtle as well as in profound ways. 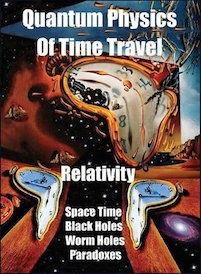 That is, one hemisphere may experience and store certain information in memory and at a later time in response to certain situations act on those memories, much to the surprise, perplexity, or chagrin of the other half of the brain; one hemisphere cannot always gain access to memories stored in the other half of the brain.